Just when you thought the industry couldn’t get any bigger, the total amount of Colorado weed sales were over $125 million. Just when you thought the sales of legal weed couldn’t get any bigger, Colorado’s legal weed industry made its 11th consecutive $100 million month, which happened over the month of April. But despite breaking that 100 million mark, the month still fell short of making its monthly high. The high was expected, as April is the month that the “high holiday” that is 420 takes place in. From the moment that weed became legal, back in 2014, Colorado weed sales have only been growing (if you’ll excuse the pun). But the industry continues to set and surpass new benchmarks. How is that total added up? It takes into account all of Colorado’s dispensaries, which took in a total of $125.2 million, in both medical and recreational sales of flower, edibles and concentrates. That total was published by The Cannabist, who calculated the figure by extrapolating Colorado’s cannabis taxes and fees data. Breaking those numbers down further, it shows that recreational weed sales totaled nearly $88.4 million, while medical sales approached $36.9 million. For the year through April, it means the industry brought in close to $492 million, which is nearly a 27 percent increase from first four months of 2016. According to the Cannabist’s archived data shows, that last number was $388 million for the months from January to the end of April. 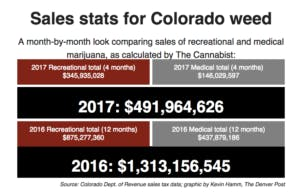 With the sales amounting to almost $500 million, it means that the year-to-date sales have resulted in more than $76.3 million in taxes and fees generated for the state, according to the data from the Colorado Department of Revenue. It must be noted that the monthly sales numbers may have some room for error, as Colorado cautions that monthly collections could include late filings and those submitted for corrections from previous months. Despite April not being as successful as predicted, the financial highs have been broken multiple times, with a new monthly high being set four times. The best month to date was March 2017, which boasted sales of $131.7 million, which has yet to be topped. But while new highs are expected, there are some economists and analysts who have told The Cannabist that they expect Colorado’s industry to “top out at some point,” especially likely after recreational marijuana programs in other states come online. (I) wouldn’t be surprised if Colorado’s marijuana industry wasn’t done setting monthly records. The year-over-year rates of growth have continued at a steady pace, which, to me, indicates that we have not yet reached the point at which we are starting to cap out the market.